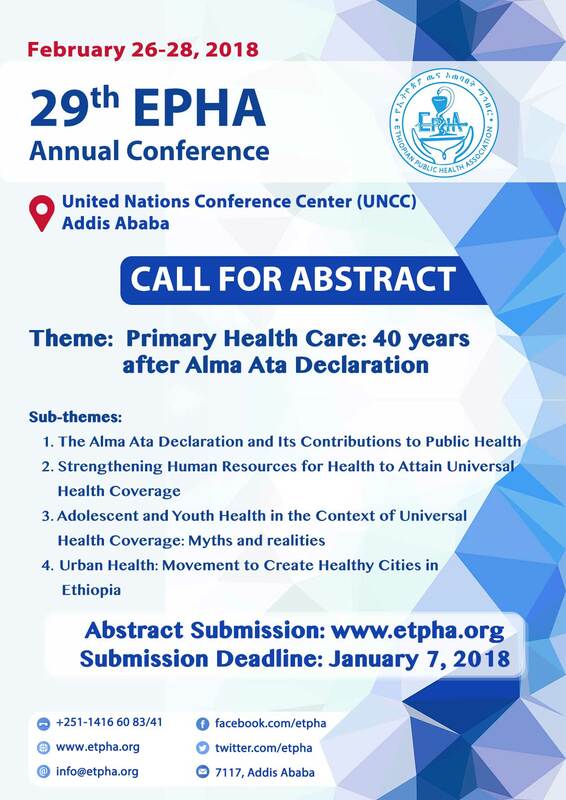 The Ethiopian Public Health Association (EPHA) has planned to conduct its 29th annual conference in United Nations Conference Hall, Addis Ababa from February 26-28, 2018. During this conference time, various scientific papers will be presented by researchers, policy makers and programmers. EPHA would also like to inform you that, the duration of online registration to attend the conference is until January 31, 2018. Please visit Registration. As you know, the 29th Ethiopian Public Health Association annual conference will be convened in United Nations Conference Center, Addis Ababa from February 26-28, 2018. During this conference time, various scientific papers will be presented by researchers, policy makers and programmers. Therefore, EPHA is pleased to invite its members and other interested individuals to take part in reviewing abstracts submitted by various authors. To take part in abstract review, the reviewers must have the following requirements. 3) Experience in reviewing scientific papers.